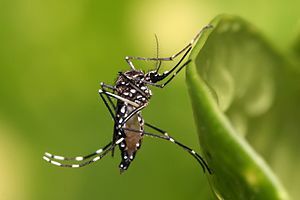 Some blood sucking insects prefer to bite during the day….the ones that give you dengue fever virus for example, so bed nets are less useful. Some researchers are working on ‘curtain technology’ , sounds good doesn’t it. Not making sure you get the right track to hold up your curtain but curtains with insecticide impregnated to stop and repel mosquitoes coming in through house windows and doors. This entry was posted on Thursday, November 11th, 2010 at 4:39 pm	and tagged with Dengue fever and posted in Tropical disease. You can follow any responses to this entry through the RSS 2.0 feed.